Elisabetta Sirani (1638–1665), Portia Wounding her Thigh (1664), oil on canvas, 101 × 138 cm, Collezioni d'Arte e di Storia della Fondazione della Cassa di Risparmio, Bologna, Italy. Wikimedia Commons. 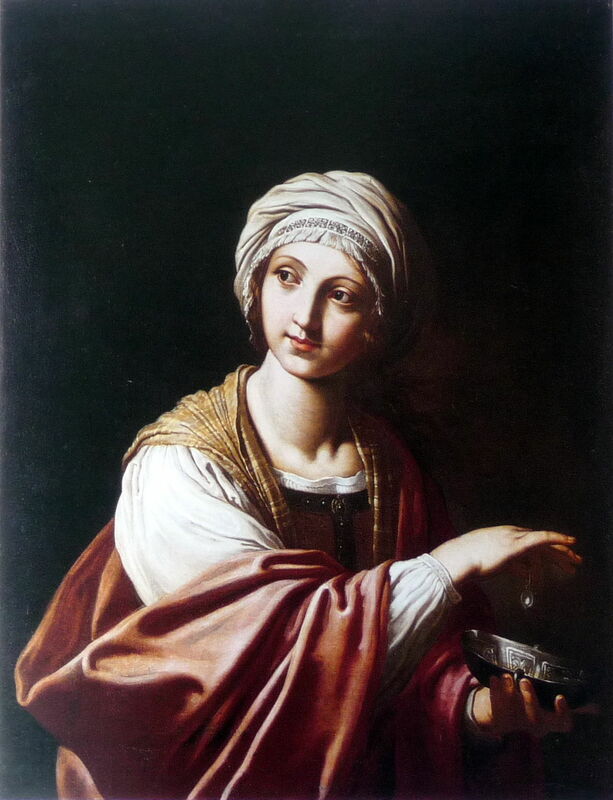 In the previous article, I described Elisabetta Sirani’s early career, from 1654, when she took over her father’s workshop, until the late 1650s. As with most workshops of the day, the Siranis trained students and apprentices. Unusually, even for Bologna which was more welcoming to women artists, she took on many young women trainees, including her two younger sisters, and at least twelve others. Her most enthusiastic fan was the art historian Carlo Cesare Malvasia, who claimed that it was he who encouraged her father to train her in the first place. Malvasia published her biography in his two-volume account of Bolognese painters published in 1678. From about 1660, she started to concentrate more on smaller, devotional images, which became very popular with collectors and connoisseurs of the day. Elisabetta Sirani (1638–1665), Saint Lucia (date not known), oil on canvas, other details not known. Wikimedia Commons. Saint Lucia (date not known) consecrated her body – and virginity – to God, and refused to marry. Her intended husband denounced her, and she was sentenced to be put into a brothel to be defiled. She refused to move, and could not be moved, so was finally put to death by the sword. 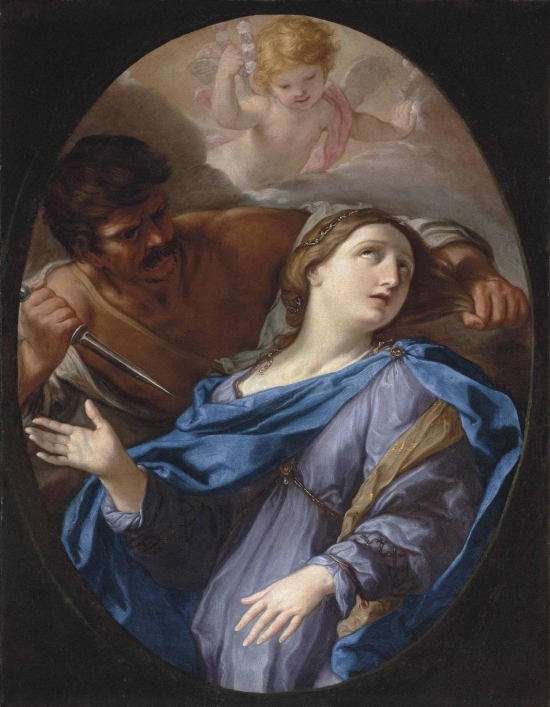 Sirani dresses her in the blue more usually associated with the Virgin Mary, and she looks up to the heavens as a man brings his dagger to bear on her. Elisabetta Sirani (1638–1665), The Triumph of Love (date not known), oil on canvas, 62 x 74.5 cm, Private collection. Wikimedia Commons. 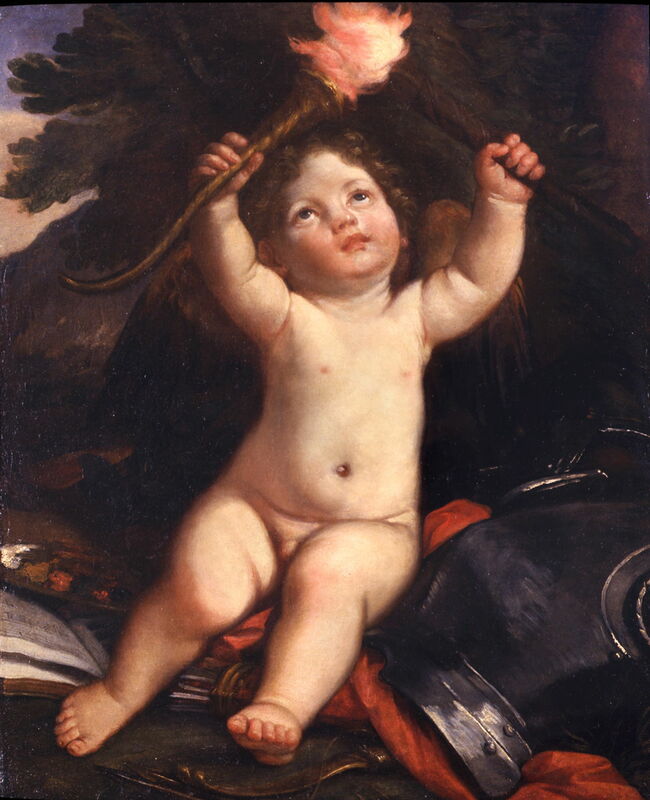 The Triumph of Love (date not known) is another of Sirani’s delightful portraits of infants, here lighting one brand from another. Elisabetta Sirani (1638–1665), Cleopatra (or The Flea) (date not known), oil on canvas, 94.6 × 75.6 cm, Flint Institute of Arts, Flint, MI. Wikimedia Commons. Cleopatra (date not known) is more of a puzzle. More Caravaggist in its use of chiaroscuro, it is also known as The Flea, and appears to show a young woman dropping a flea into a small bowl. This does not seem to correspond with Cleopatra as a Queen of Egypt, so I am not sure whether this work has been incorrectly titled. Elisabetta Sirani (1638–1665), Love and Psyche (date not known), oil on canvas, dimensions not known, Museum der bildenden Künste, Leipzig. By Sailko, via Wikimedia Commons. Love and Psyche (date not known) also has a wide tonal range if not chiaroscuro, and soft modelling of the bodies. Elisabetta Sirani (1638–1665), The Young Saint John the Baptist (date not known), oil on panel, 69.9 x 48.3 cm, Private collection. Wikimedia Commons. 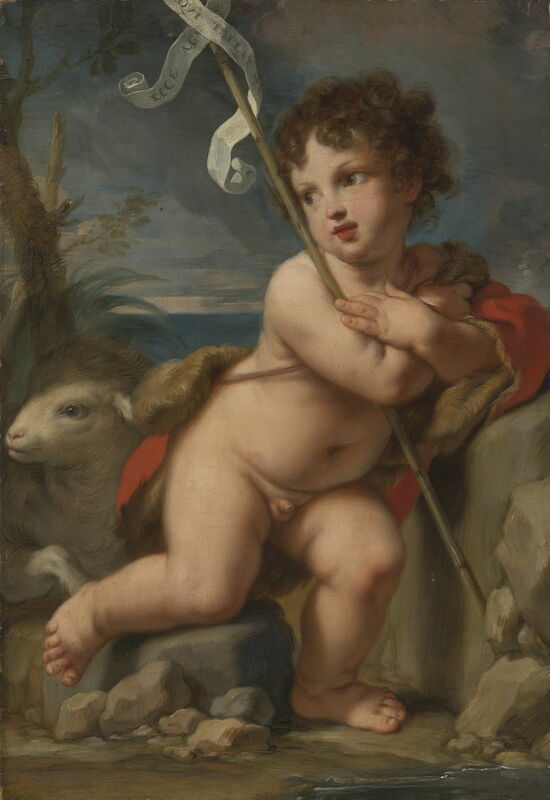 The Young Saint John the Baptist (date not known) may have been intended to accompany a painting of the infant Jesus. John is accompanied by his attributes of a superbly painted lamb, the inscription attached to the stick, and the camel-skin lining to the cloak. 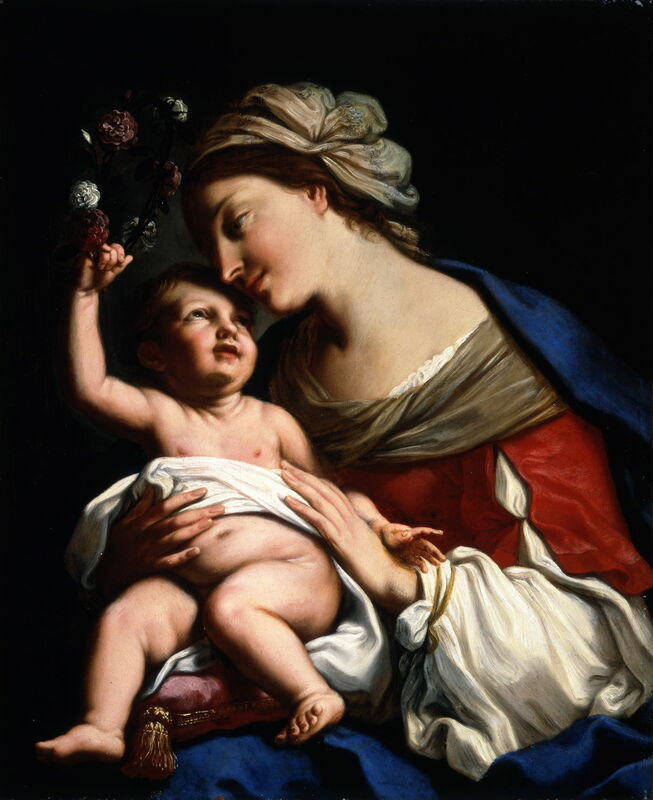 Elisabetta Sirani (1638–1665), Virgin and Child (1663), oil on canvas, 86.3 x 69.9 cm, National Museum of Women in the Arts, Washington, DC. Trivium Art History. Sirani painted several works exploring the close maternal relationship between the Virgin Mary and the infant Christ, of which Virgin and Child (1663) is one of the most human and realistic. 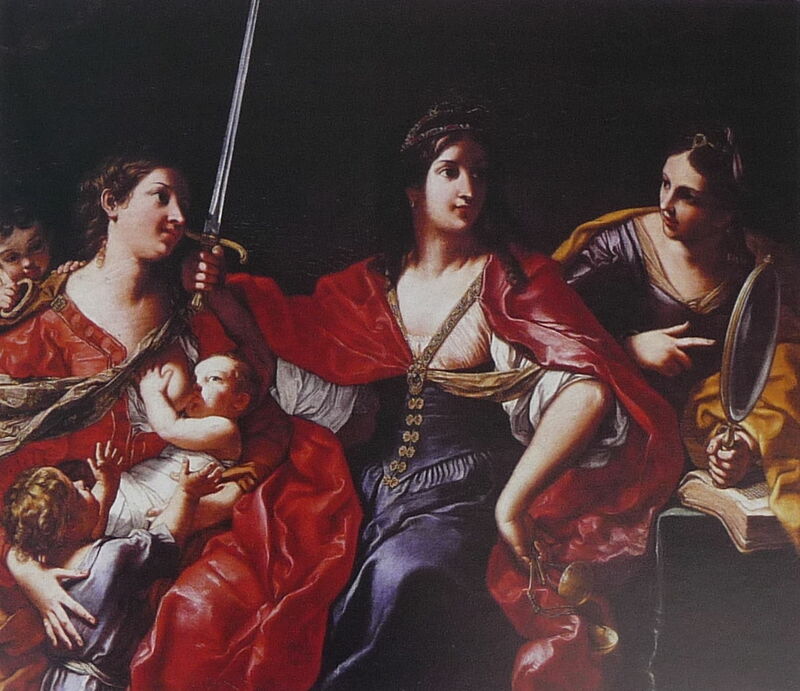 Elisabetta Sirani (1638–1665), The Virtues: Justice, Charity, and Prudence (Wisdom) (1664), oil on canvas, dimensions not known, Modena, Italy. Wikimedia Commons. The triple allegorical portrait of The Virtues: Justice, Charity, and Prudence (Wisdom) (1664) is one of her more complex works, and shows Charity nursing children, Justice brandishing a sword and holding a set of scales, while Prudence draws attention to their own images. Elisabetta Sirani (1638–1665), Portia Wounding her Thigh (1664), oil on canvas, 101 × 138 cm, Collezioni d’Arte e di Storia della Fondazione della Cassa di Risparmio, Bologna, Italy. Wikimedia Commons. 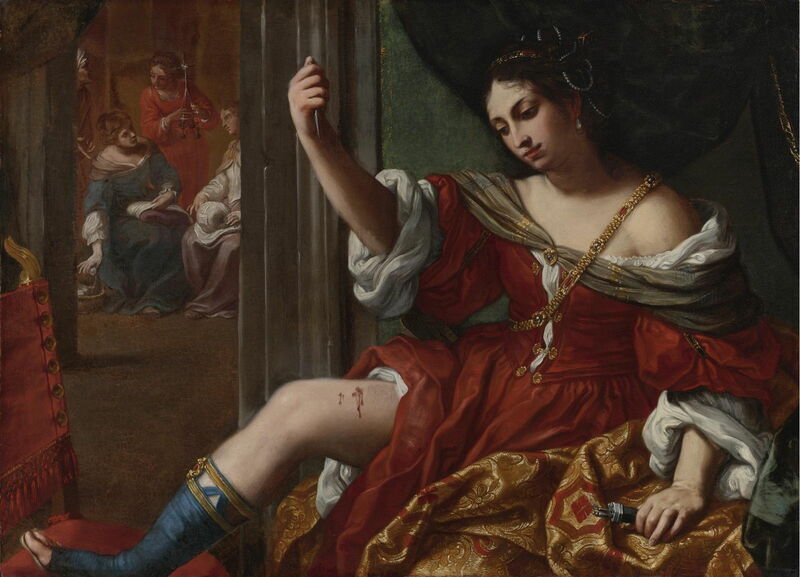 Portia Wounding her Thigh (1664) refers not to the Portia of Shakespeare’s play The Merchant of Venice, but to Portia or Porcia Catonis, wife of Marcus Junius Brutus, one of Julius Caesar’s assassins in 44 BCE. Getting wind of the plot to murder Caesar, Portia asked Brutus what was wrong. He did not answer, fearing that she might reveal any secret under torture. She therefore inflicted wounds to her thigh using a barber’s knife to see if she could endure the pain. As she overcame the pain of her wounds, she declared to Brutus that she had found that her body could keep silence, and implored him to tell her. When he saw her wounds, Brutus confided all in her. This is a most unusual story for a painting, but singularly appropriate for such a talented young woman achieving success in her artistic career. By August 1665, she had completed nearly 200 paintings, many fine drawings, and various prints. She died so suddenly that it was at first suspected that she might have been murdered. It transpired, though, that she had suffered fulminating peritonitis as the result of a burst peptic ulcer. The Sirani workshop had lost its leader, and her many young female students their teacher. Her hopes of a new generation of brilliant women painters in Bologna were dashed. Posted in General, Painting and tagged painting, Reni, Sirani. Bookmark the permalink.